The No. 1 rule of dogsledding is very simple: Don’t ever let go of the sled. “If you don’t hold on, you’re going to be sitting in the snow, and the dogs are going to keep going,” said Sarah Spalla, manager of Good Times Adventures and my guide and teacher for my first-ever foray into the art of mushing. That’s easier said than done, though, especially as you’re tearing down a trail in the Swan River Valley, eight dogs ahead of you pulling against their harnesses with every ounce of their strength. And the sled just keeps going faster and faster. The dogs – they know exactly what they’re doing. We take a sharp right turn down a gully banked steeply on both sides with snow. The dogs are flying. The sled is flying. No, literally, at the top of the embankment, the sled goes airborne, soars over the small ditch and slams to the ground. And there I am, sitting in the snow, while the dogs are (happily) hurrying down the trail. So much for a simple rule. I was surrounded by dogs. Standing in the middle of the dogyard at Good Times Adventures, there were roughly 139 Siberian huskies – and exactly one Alaskan husky – prowling around the area filled with dog houses and kennels. This is where my day of dogsledding started. Good Times is located off Tiger Road outside Breckenridge. The directions are easy: turn on Tiger Road, go straight until you hit the parking lot about 6.3 miles back. At the facility, they have both snowmobiling and dogsledding – on different trails of course – and there are also horse-drawn sleigh rides available, although through a different company. The dogyard is an area that most guests don’t normally get to see. It’s where the dogs rest, eat and sleep. At Good Times (called Snow Caps Sled Dogs in the summer), 75 percent of the dogs you see were bred at the facility. Nearly all of them become sled dogs. Spalla, who’s been a guide for seven years, said the dogs are trained for their duties starting at 4-months old. “Really, it’s pretty amazing how it just seems to be bred into them to do it,” she said. In the dogyard, the huskies range in age from 10 or 11 years old all the way down to the newest litter born only three weeks ago. As Spalla hooked up the dogs to the sled, that was all I was thinking about. Before getting started, though, she went over some basics. The dogs are set in teams of eight, broken down into four pairs of two. The front dogs are your “lead” dogs, normally the brightest and most focused of the bunch. For our team, the lead dogs were Sputnik and Nemo. Next in line are the “point” dogs, Shadow and Kival. Then there’s the “team” dogs, which Spalla said are normally either young pups or dogs with “a little less brains” than the rest. Our’s were Trigger and Little Bully. Finally, in the back are the “wheel” dogs — the biggest and strongest of the bunch. One of our dogs at the back was Rostov, Sputnik’s brother and a former leader. The other was Bear, whose thick, fluffy coat insures that no one would forget why he got his name. “Think of it as going smartest to strongest in a way,” Spalla said of the formation. Now, the commands are pretty basic. For a novice driver, like myself, there are really only three – and none of them mean stop or slow down. Saying “hike” tells the dogs to move forward or run harder. “Gee” means turn right, and “haw” is for left. To stop, you simply step on the brake – a metal hinge – at the back of the sled. “What about mush?” I asked, still clinging to my dream. 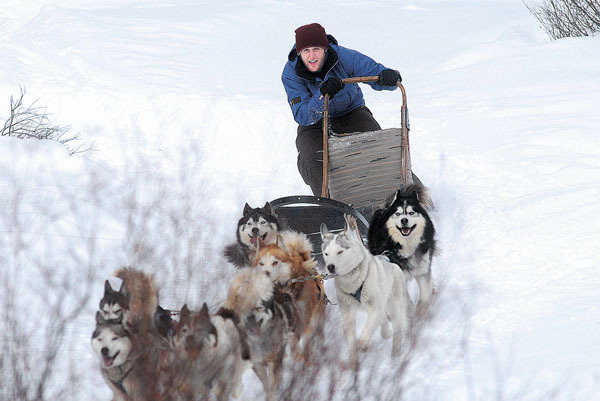 The dogsled tours at Good Times are done in a relay format. Spalla said that guides normally take six people per trip, and each person switches among driving the sled, sitting in the sled and watching from a trailer towed behind a snowmobile. The guide drives the snowmobile up ahead, and the dogs simply follow behind. So, it’s pretty much up to the guide to determine what trails everyone takes for the tour. Even though my experience at the time basically consisted of watching the movie “Iron Will” a lot as a kid, I chose to go the more difficult route. And things went really well – at first. We took some sharp turns, and I leaned in to help the sled stay stable. We hit some uphills, and I took a foot off the sled to help the dogs with a “musher’s kick.” Really, I was getting the hang of it. That is, until we came to that gully I mentioned earlier, and I broke that ever-important No.1 rule. So, now we’re back to where I’m sitting in the snow. Luckily, Spalla was up ahead to stop the dogs, and my body was far less banged-up than my self-esteem. And after another fall, one hit tree and a few more trails, we made it back to the dogyard in one piece. The tour was over, and each dog got an end-of-the-run reward: a steamy bowl of water with chunks of meat scraps. As for me, I simply got the satisfaction of fulfilling a childhood fantasy. Sure, I was covered in snow and my shoulder was a bit sore (and I think the sled may have been cracked from my run-in with that pesky lodgepole pine), but I hardly even noticed at the time. Although, I don’t think I’ll be signing up for the 1,100-mile Iditarod Trail Sled Dog Race any time soon. I still need to work on rule No. 1.